Cliff Kapson Consulting is a residential and commercial evaluation company on exterior claddings. One inspection we compose is for Exterior Insulation and Finish System compliance, otherwise known as “EIFS”. Our inspections test exterior walls for insulation effectiveness, water-resistance, the finished surface appearance. The main purpose of Exterior Insulation and Finish System inspections is to assess water penetration issues that may be present and have them addressed. For more information on Exterior Insulation and Finish System inspections from Cliff Kapson Consulting, contact us today at 888.304.3437 or simply fill out the form on the right and someone will get back to you shortly with more information. The two types of Exterior Insulation and Finish Systems are Barrier and Water-Managed. 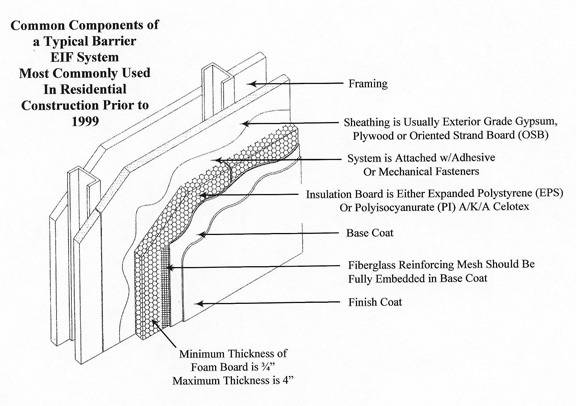 The Barrier Exterior Insulation and Finish Systems’ application were before the year 2000, where-as the Water-Managed Exterior Insulation and Finish System was introduced around 1996. We can inspect both types of Exterior Insulation and Finish Systems and make recommendations for repairs, when needed. All the manufacturers of Exterior Insulation and Finish Systems recommend regular inspections and maintenance to prolong the life of the product. There are two types of inspection processes, the visual inspection to indicate possible damage or moisture penetration points along the surface of the Exterior Insulation and Finish System. The second type of Exterior Insulation and Finish System inspection is a probe that takes moisture readings from below the surface. The visual and probe inspection of the Exterior Insulation and Finish Systems should be composed by professional for accurate and reliable results. Call Cliff Kapson Consulting now for Exterior Insulation and Finish System inspections at 888.307.3437 or fill out the easy-to-use form along the right and we will get back to you right away.